mAmunigaL states in upadhEsa raththina mAlai that our sath sampradhAyam is named as emperumAnAr dharisanam (rAmAnuja dharsanam) by SrI ranganAthan himself so that everyone will forever remember the contributions of emperumAnAr towards this eternal sampradhAyam. SrI rAmAnuja was neither the founder of this sath sampradhAyam nor the only AchArya of this sampradhAyam. But he anchored the sampradhAyam so firmly that it will remain afloat forever which is why he is greatly glorified. If attempted, one can some how try to comprehend and speak the glories of emperumAn. But emperumAnAr’s glories are so limitless that, it is difficult for any one to fully comprehend and speak about them too. But we are blessed to have his sambandham through our glorious guru paramparai and with that strength let us enjoy emperumAnAr’s glories, little by little. Adhi sEshan’s different forms in different yugas are explained and his incarnation in kali yuga is also predicted. It is established in charamOpAya nirNayam that SrI rAmAnuja is that kali yuga avathAram of Adhi sEshan. In rAmAnusa nURRanthAdhi, amudhanAr glorifies emperumAnAr’s birth as that which is even greater than emperumAn’s birth by saying “maNmisai yOnigaL thORum piRanthu engaL mAdhavanE kaNNuRa niRkilum kANagillA ulagOrgaLellAm aNNal irAmAnusan vandhu thOnRiya appozhuthE naNNaru gyAnam thalaikkoNdu nAraNaRkAyinarE”. mAmunigaL explains this as “Even when our master SrIman nArAyaNan himself appeared in various forms in this world, worldly people did not accept him as master. But as soon as emperumAnAr appeared in this world (and explained SrI bhAshyam, etc), the worldly people understood the true knowledge and became real servitors of bhagavAn”. mAmunigaL also glorifies the birth of SrI rAmAuja in his Arthi prabandham as “enaippOl pizhai seyvAr ivvulagil uNdo, unaippOl poRukka vallAr uNdO anaiththulagum vAzhap piRantha ethirAsa mAmunivA Ezhaikku irangAy ini” which means “Is there any one like me to commit mistakes and is there anyone like you to forbear them? Oh king of mendicants who appeared to uplift all! please help me”. From these, we can understand that bhagavath rAmAnuja appeared to eliminate the sorrows of all and uplift them to the spiritual realm to serve emperumAn eternally. He was born as the son of kEsava sOmayAjiyAr and kAnthimathi ammAL. periya thirumalai nambi, his maternal uncle names him “iLaiyAzhwAr” and initiates him in SrIvaishNavam by performing thApa samskAram to him. In his early days, he studied vEdhAntham under yAdhavaprakAsa who was a proponent of a school of thought named “bhEdhAbhEdham” (brahmam/AthmA being simultaneously different and same). A question may arise - why should he study under a scholar of a different school of thought? Our elders explain that he did that to understand their philosophy thoroughly to expose the defects in them and establish visishtAdhvaitha (qualified monism) school of thought. This principle can be understood by seeing how periyavAchchAn piLLai glorifies his Acharya nampiLLai in his vyAkyAnam for periya thirumozhi 5.8.7 while explaining “anthaNan oruvan” (unique brAhmaNa). He says “muRpada dhvayaththaik kEttu, ithihAsa purANangaLaiyum athigariththu, parapaksha prathikshEpaththukkudalAga nyAyamImAmsaikaLum athigariththu, pOthupOkkum aruLicheyalilEyAmpadi piLLaiyaippOlE athigarippikka vallavanaiyirE oruvan enbathu” (One who hears dhvayam first, then learns purANams and ithihAsams, learns nyAyam and mImAmsai to win over other philosophies through debate and spends all his time in learning and teaching AzhwAr’s aruLicheyal and its meanings like nampiLLai can be said as a unique scholar). From this we can understand the importance of learning pUrva paksham (arguments of other philosophers) for establishing one’s own sidhdhAntham. During SrI rAmAnuja’s study under yAdhavaprakASa, some disagreements arise between them. SrI rAmAnuja was also gaining popularity due to his astute knowledge in philosophy and the ability to explain the same to others. Unable to bear the rise of SrI rAmAnuja’s stature, yAdhavaprakASa’s disciples plot to kill him during a yAthrA to kASi. But with the timely advice of gOvindha (who will become embAr in future), rAmAnuja escapes their plot and returns back to kAnchIpuram with the help of perundhEvith thAyAr and SrI varadharAjap perumAL (dhEvap perumAL) who appear in the guise of a hunter couple to guide SrI rAmAnuja during his escape in the forest. This incident ends up being the defining moment in SrI rAmAnuja’s life. thirukkachchi nambi explains the six instructions of dhEvap perumAL to SrI rAmAnuja and enquires if it matches SrI rAmAnuja’s thinking. SrI rAmAnuja offers his obeisances to nambi and confirms the same. nambi becomes amazed at the synchronization of emperumAn’s and SrI rAmAnuja’s divine minds. After hearing these instructions, SrI rAmAnuja starts his journey towards SrIrangam to meet periya nambi. periya nambi is one the prime Sishyas of ALavandhAr (yAmunAchArya) who was the grand son of nAthamunigaL. Earlier, ALavandhAr, who was the foremost leader of the sampradhAyam, graced SrI rAmAnuja during one of his visits to kAnchIpuram and blessed him to become the great preceptor. SrI rAmAnuja too, having heard about ALavandhAr, wanted to become his disciple. But during his previous visit to SrI rangam to meet ALavandhAr, by the time SrI rAmAnuja reaches the banks of cauvery river, ALavandhAr ascended to paramapadham with three unfulfilled desires viz., 1) showing gratitude towards vyAsa and parAsara rishis, 2) showing gratitude towards nammAzhwAr and 3) having a commentary written for SrI bhAshyam. On seeing ALavandhAr’s divine final form with 3 folded fingers, SrI rAmAnuja vows to fulfill those desires and immediately the fingers become unfolded. SrI rAmAnuja, then dejectedly returns to kAnchIpuram to continue his kainkaryam. Subsequently in SrIrangam, SrIvaishNavas request periya nambi to bring SrI rAmAnuja into the fold through initiation and nurture him to be the next leader. periya nambi, starts his journey towards kAnchIpuram with the intent of accepting SrI rAmAnja as his disciple. They both meet at madhurAnthakam, a town located close to kAnchIpuram. When SrI rAmAnuja arrives at the Eri kAththa perumAL temple, he sees periya nambi with his family there, offers his obeisances and requests nambi to accept him as a disciple. periya nambi indicates that they could all go to kAnchIpuram and have it done there. But SrI rAmAnuja says that there is so much volatility in this world that he lost the opportunity to become a disciple of ALavandhAr and he does not want such things to happen again. So, he insist nambi to perform pancha samskAram immediately and nambi obliges. Thus SrI rAmAnuja personally demonstrated the importance of taking shelter of an AchArya in the proper manner as directed in SAsthram. They all reach kAnchIpuram after that and periya nambi along with his family decides to stay there for some time. Once, when a SrIvaishNava visits SrI rAmAnuja’s residence and says he was hungry, he asks his wife to give him some food but his wife says there is none left. The SrIvaishNava leaves dejected and when SrI rAmAnuja goes to the kitchen he finds lots of food remnants. He becomes very angry and shows that anger to his wife. Previously too, rakshakAmbAL (SrI rAmAnuja’s wife) behaved improperly towards thirukkachchi nambi. When SrI rAmAnuja invited thirukkachchi nambi to his residence to consume prasAdham of which he could accept the remnants, his wife feeds nambi but throws out the remnants and sanctifies the place where nambi accepted prasAdham without understanding nambi’s greatness and SrI rAmAnuja’s desire. Finally, once there occurs a quarrell between rakshakAmbAL and periya nambi’s wife while fetching water from the well. periya nambi, being deeply offended, with his family, leaves to SrIrangam quietly without informing SrI rAmAnuja. SrI rAmAnuja learns about it later and becomes deeply hurt. He at once became very firmly situated in his mission of total commitment to bhagavAn and thus decided to take up the renunciate order of sanyAsa ASramam. He performed a sacred bath in anantha saras tank in kAnchIpuram dhEvap perumAL temple, went to dhEvap perumAL, accepted him as AchArya and requested him to present him thridhaNdam, kAshAyam etc which are suitable for sanyAsis. dhEvap perumAL acknowledged SrI rAmAnuja’s desire, presented him sanyAsa ASramam, named him “rAmAnuja muni” and gave him a mutt too. On hearing this mudhaliyNdAn and kUraththAzhwAn swiftly reached kAnchIpuram and accepted pancha samskAram from him and started serving him constantly. yAdhavaprakASa too, becomes a Sishya of him, on the advise of his mother. Thus SrI rAmAnuja became rAmAnuja muni and started conducting sanyAsa life in a glorious manner. SrI rAmAnuja becomes to be famously known as yathirAja (king of ascetics), magnanimously accepts yAdhavaprakASa as his disciple, initiates him into the sanyAsa ASramam (ascetic order) and names him gOvindha jIyar. He also makes him write a detailed treatise named “yathi dharma samuchchayam” which is considered as the authority for the conduct of SrIvaishNava sanyAsis. This shows the magnanimous nature of SrI rAmanuja who accepted yAdhavaprakASa (who even tried to kill him earlier) and engaged him in valuable kainkaryam. Statying in kAnchIpuram, He teaches essential portions of SAsthram to kUraththAzhwAn and mudhaliyANdAn. 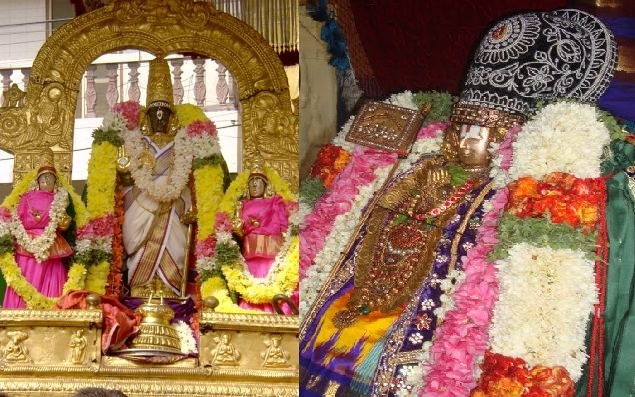 SrIranganAtha, wanting to bring SrI rAmAnuja to SrIrangam to nurture the sampradhAyam into great heights, sends a request to kAnchIpuram SrI varadharAja to send SrI rAmAnuja over. SrI varadharAja does not heed to SrI ranganAtha’s request. Plotting a trap, SrIranganAtha sends thiruvarangap perumAL araiyar over to kAnchIpuram to sing divine songs in front of SrI varadharAja, please him and accept SrI ramAnja as the prize. araiyar reaches kAnchipuram, approaches emperumAn through thirukkachchi nambi, sings in front of SrI varadharAja and emperumAn becomes mesmerized by araiyar’s singing. He then says “Whatever you ask for, that shall be granted”. At once, araiyar asks emperumAn to send SrI rAmAnuja along with him to SrIrangam. emperumAn becomes very morose that he had to lose the company of SrI rAmanuja - but since he had given the word, he sends yathirAja along with araiyar. On reaching SrIrangam, araiyar and yathirAja get a cheerful welcome. They both go to periya perumAL (SrIranganAtha mUlavar) and periya perumAL receives them with great joy. He bestows the title “udaiyavar” (owner of both spiritual and material realm) to yathirAja, allocates him a mutt to stay and orders him to reform the temple activities fully. He also assures liberation for all those who are related to SrI rAmanuja. udaiyavar, feeling greatly indebted to periya nambi, thanks him. periya nambi too feels great joy in seeing good times ahead for the sampradhAyam. udaiyavar then starts reforming the temple activities with great expertise spending his time in SrIrangam. SrI rAmAnuja, thus stays in SrIrangam and manages the temple activities efficiently. Wanting to reform gOvindha (his cousin who saved his life when they were going on a pilgrimage along with yAdhavaprakASa) who became a devotee of Siva and stayed in kALahasthi, SrI rAmAnuja requests periya thirumalai nambi to instruct him and bring him back to our sampradhAyam. periya thirumalai nambi visits kALahasthi and intercepts gOvindha who had become an ardent devotee of Siva and was serving him sincerely. He explains the supremacy of SrIman nArAyaNan based on ALavandhAr’s teachings in sthOthra rathnam and dhivya prabandha pAsurams. On hearing those instructions a few times, gOvindha’s mind becomes purified and he gives up his attachment to rudhra and at once falls at the lotus feet of periya thirumalai nambi. nambi, accepts him with great happiness, performs pancha samskAram to him and brings him along. gOvindha stays with nambi in thirumalA, learns all the essential meanings and fully serve nambi. Eventually gOvindha would come back to SrIrangam to permanently stay with SrI rAmAnuja (we would see this in subsequent episodes). SrI rAmAnuja then goes periya nambi’s thirumALigai (residence) and requests him to teach him all the important topics. nambi being pleased, teaches the divine meanings of the most divine dhvaya mahA manthram to SrI rAmAnuja. He then instructs SrI rAmAnuja “there is still more to learn in this topic; please go to ALavandhAr’s dear disciple thirukkOshtiyUr nambi and learn that from him”. SrI rAmAnuja at once ventures to the divine town thirukkOshtiyUr. On entering the town, he asks the whereabouts of thirukkOshtiyUr nambi’s thirumALigai to the residents of the town. Once they showed the direction, he reaches the thirumALigai by fully offering praNAmams (obeisances) at every step to the astonishment of the residents of the town who came to know the glories of nambi then. SrI rAmAnuja falls flat at the lotus feet of nambi and prays him to teach the confidential meanings. But nambi does not show much interest to teach him the meanings and thus SrI rAmAnuja returns dejected to SrIrangam. After SrI rAmAnuja returns to SrIrangam, he longs to learn the secret teachings from thirukkOshtiyUr nambi. nambi once visits SrIrangam and while returning back, namperumAL orders nambi to instruct the secret teachings to SrI rAmAnuja. nambi says to namperumAL that according to SAsthram, these secret meanings cannot be instructed to those who have not rendered dedicated service. namperumAL says that as SrI rAmAnuja has all qualifications to be a good Sishya, there is nothing wrong in instructing him. nambi then tells SrI rAmAnuja to come and visit thirukkOshtiyUr to learn the meanings. SrI rAmAnuja then visits thirukkOshtiyUr and nambi asks him to come again later. This happens for 18 times. Unable to bear the situation, SrI rAmAnuja informs through a Sishya of thirukkOshtiyUr nambi that he desperately wants to learn those meanings. Finally nambi agrees to teach those meanings and SrI rAmAnuja learns to the secret meanings of gIthA charama SlOkam. nambi requests SrI rAmAnuja not to reveal the meanings to undeserving individuals. But SrI rAmAnuja reveals the meanings to those who desire to know the same. Hearing this nambi becomes furious and summons SrI rAmAnuja. SrI rAmAnuja explains to nambi that by those who learned the secret meanings would be greatly benefited by gaining true knowledge. Understanding the magnanimous nature of SrI rAmAnuja, nambi hails him as “emperumAnAr” (greater than emperumAn SrIman nArAyaNan). Subsequently, our sampradhAyam too become to be popularly known as “emperumAnAr dharisanam” (SrI rAmAnuja dharSanam). emperumAnAr then teaches the secret meanings to kUraththAzhwAn and mudhaliyANdAn too on their request. Subsequently, thirukkOshtiyUr nambi instructs thirumAlai ANdAn to teach the meanings of thiruvAimozhi to emperumAnAr. emperumAnAr enthusiastically starts learning all the necessary meanings from ANdAn. Few times, ANdAn and emperumAnAr end up with different opinions on certain pAsurams and while learning thiruvAimozhi 2.3.3 “aRiyAk kAlaththuLLE” pAsuram, ANdAn becomes upset with emperumAnAr giving different meaning and stops his lecture. thirukkOshtiyUr nambi hears about the incident and at once rushes to SrIrangam. He explains the greatness of emperumAnAr to ANdAn and instructs him to continue the lectures whatever it takes to do so. ANdAn agrees and continues his lectures to emperumAnAr. Yet again, there was a disagreement and emperumAnAr says “ALavandhAr would not explain like this”. ANdAn asks “How would you know if you have never met ALavandhAr?” and emperumAnAr says “I am like Ekalavya for ALavandhAr”. Hearing that ANdAn realizes thirukkOshtiyUr nambi’s description of emperumAnAr’s stature matches what he hears from emperumAnAr himself. He then realizes that emperumAnAr is a special incarnation and feels that he would hear those meanings which he may have missed to hear from ALavandhAr directly and treats emperumAnAr with great respect. After completing thiruvAimozhi lecture series, he goes back to periya nambi and periya nambi instructs emperumAnAr to go and serve thiruvarangap perumAL araiyar and learn some confidential meanings from him. emperumAnAr goes to araiyar and sincerely serves him for 6 months by preparing milk and grinding turmeric paste. Once the turmeric paste that was submitted by emperumAnAr was not pleasing enough to araiyar and araiyar reveals his displeasure. emperumAnAr at once prepares a new batch and submits that for the full pleasure of araiyar. Araiyar being very pleased, instructs the confidential principle of “charamOpAyam” (the ultimate means) of being fully dependent on the AchArya for everything. One may wonder why emperumAnAr should learn from many AchAryas,. Just like a king would appoint many of his ministers to groom the prince, ALavandhAr gave wealth of knowledge to many of his Sishyas and ordered them to teach that knowledge to emperumAnAr at the right time. All these Sishyas of ALavandhAr too had great attachment and respect towards SrI rAmAnuja, since he was very dear to ALavandhAr himself. That is why the AchAryas before emperumAnAr gained great fame by being the AchArya of emperumAnAr himself and needless to say, empermAnAr’s Sishyas achieved great fame due to their connection with him. Just like a center-piece in a necklace would add glory to both the sides of the necklace, emperumAnAr adds glory to both AchAryas before and after him. Subsequently, emperumAnAr recites gadhya thrayam on a wonderful panguni uthram day in front of SrI ranganAyaki and SrI ranganAthan in SrIrangam. He also compiles nithya grantham which details the method of worshiping emperumAn at home. At this time, emperumAnAr was accepting bhikshai (food by alms) in SrIrangam and consuming them. Some people who did not like his reforms in the SrIrangam temple, arrange for one of the women to give poisoned rice to him. She unwillingly follows the order and shows great discomfort while offering alms to emperumAnAr. emperumAnAr realising somethng is not wrong, throws out that food in to the cauvery river and starts fasting. thirukkOshtiyUr nambi hears about this incident and at once rushes to SrIrangam. emperumAnAr goes to welcome him in very hot sunny day to the banks of cauvery. Seeing nambi, he falls flat on ground and offers his obeisances and wait for nambi to order him to rise up. nambi hesitates for a moment and kidAmbi AchchAn, a disciple of emperumAnAr, at once lifts up emperumAnAr saying to nambi “how can you let such great AchArya suffer in this heat?”. nambi said to AchchAn “I have found that you are the best person to care for him since you lifted him even disrespecting me. So, you should prepare his prasAdham every day”. This way, everyone showed their care and concern towards emperumAnAr. Once a great mAyAvAdha scholar named yagya mUrthi who won over many scholars in vAraNAsi and became a sanyAsi there and had great wealth of accolades and disciples, heard about the glories of SrI rAmAnuja and arrived in SrIrangam. He challenged SrI rAmAnuja for a debate. SrI rAmAnuja agreed for the debate. Yagya mUrthi said “If I lost the debate, I will carry your sandals on my head, accept your name and embrace your philosophy”. udaiyavar said “If I lost I will give up indulging in literary efforts”. Both had a fierce debate which went on for 17 days. On the 17th day, yagya mUrthi started winning and left with great pride. SrI rAmnuja became aggrieved and said to his peraruLALap perumAL (his mutt deity) “The great sampradhAyam which was nurtured by stalwarts from AzhwAr to ALavandhAr is losing ground because of me; now it is being destroyed by a mAyAvAdhi; if this is your desire, so be it” and go to rest without consuming prasAdham. In the night, perumAL appeared in his dream and instructed him to use the works of ALavandhAr and win over yagya mUrthi. Waking up, SrI rAmAnuja became rejuvenated, performed his daily routines and took leave from his mutt perumAL. Seeing his majestic arrival, yagya mUrthi being very knowledgeable, realises the divine intervention in the matter and at once falls at his divine feet and declares “I have lost the debate”. Being surprised, SrI rAmAnuja asks “don’t you want to debate further” and yagya mUrthi says “Since periya perumAL have spoken to you, I have understood that you are not different from periya perumAL himself. I cannot open my mouth in your presence any more”. Still SrI rAmAnuja explains the great qualities of brahmam and destroys the mAyAvAdha principles. yagya mUrthi, being convinced breaks his EkadhaNdam (the single stick, which are carried by mAyavAdha sanyAsis) and requests SrI rAmAnuja to confer him thridhaNda sanyAsam (the ascetic order of SrIvaishNava sampradhAyam). In remembrance of pEraruLALap perumAL’s divine intervention and fulfilling yagya mUrthi’s vow of accepting his name, SrI rAmAnuja names him “aruLALAp perumAL emperumAnAr”. He personally teaches his him dhivya prabandham and the in-depth meanings. aruLALAp perumAL emperumAnAr stays with emperumAnAr thereafter and be greatly devoted to him. udaiyavar continues to teach AzhwAn, ANdAn, aruLALAp perumAL emperumAnAr et al, in a grand manner in SrIrangam. Many scholars hear about the glories of udaiyavar and arrive at SrIrangam to take shelter of him. When ananthAzhwAn, echchAn, thoNdanUr nambi and marudhUr nambi arrive to accept udaiyavar as AchArya, he directs them to become disciple of aruLALAp perumAL emperumAnAr. They happily do so and aruLALAp perumAL emperumAnAr instructs them to be fully dependent on emperumAnAr’s lotus feet. Subsequently, udaiyavar was lecturing the meanings for thiruvAimozhi. When he started explaining “ozhivil kAlam” decad, he asked “if there is anyone willing to go to thirumalA thiruppathi to setup a garden and prepare garlands everyday for thiruvEnkatamudaiyAn”. ananthAzhwAn at once raises and agrees to take up this kainkaryam. emperumAnAr blesses him to do so. ananthAzhwAn goes to thirumalA, constructs a garden and a pond, names the garden “irAmAnusan” and starts serving thiruvEnkatamudaiyAn. Udaiyavar too wanting to go on a pilgrimage, requests namperumaL permission for the same. On receiving permission, he then travels to thirumalA after performing mangaLASAsanam at thirukkOvalUr and kAnchIpuram. udaiyavar started travelling towards thirumalA thiruppathi along with his disciples and at one point they lost the route. He noticed a farmer and asked him the route. As the farmer explained the route clearly, udaiyavar became overwhelmed with gratitude and offered him obeisances considering him to be amAnavan (one who leads us in the path to SrIvaikuNtam). He finally reached thiruppathi and at the foothills worships the AzhwArs. He stays in thiruppathi for some time, accepting the king as his disciple and settling many of his Sishyas there. Hearing this news, ananthAzhwAn and many others come and welcome udaiyavar and ask him to climb the hill to perform mangaLASAsanam to thiruvEnkatamudaiyAn. At first he refuses citing AzhwArs who have not climbed the hill due to its sanctity, but as the Sishyas insist, he goes to the foothill, bathes there to purify himself and climbs the hill with great subservience as he would climb the divine throne of emperumAn in paramapadham. On arrival, thirumalai nambi welcomes him with honours from thiruvEnkatamudaiyAn. udaiyavar, feeling awkward that thirumalai nambi who is one his AchAryas, arrive to welcome him, asks “did you not find some common person who is not very superior like you to welcome me?” and nambi humbly replies “as I searched around I did not find any one inferior to me”. Udaiyavar and his Sishyas became amazed hearing that. Subsequently, all jeeyars, EkAngis, temple kainkaryaparas et al come and welcome udaiyavar. Udaiyavar then goes around the temple, bathes in swAmi pushkaraNi, applies dhvAdhaSa Urdhva puNdrams, worships varAha perumAL, enters the main temple, worships sEnai mudhaliyAr and performs mangaLASAsanam to thiruvEnkatamudaiyAn. He then decides to return to thiruppathi (foothill) as he said that this is the abode of nithyasUris and we cannot stay there in the night. But nambi and others convince him to stay there for 3 days. Udaiyavar obliges and stays there without consuming any praSAdham and simply by enjoying the divine beauty of thiruvEnkatamudaiyAn. He then seeks permission from thiruvEnkatamudaiyAn to leave and at that time emperumAn re-affirms udaiyavar as the owner of both nithya vibhUthi and leelA vibhUthi and bids him farewell. He then leaves thirumalA and stays in thiruppathi for the next one year. He learns SrI rAmAyaNam from thirumalai nambi during this time with the in-depth meanings of the same. At the end of the lecture series, he seeks permission from nambi to return to SrIrangam. Nambi wants to offer some gift to udaiyavar, and udaiyavar prays that gOvindhap perumAL (who is serving thirumalai nambi with great dedication) is sent along with him to assist him in his efforts to establish the sampradhAyam. Nambi happily sends gOvindhap perumAL along with udaiyavar and udaiyavar starts his journey towards SrIrangam. udaiyavar along with gOvindhap perumAL reaches gadikAchalam (Sholingur) and performs mangaLASAsanam to akkArak kani emperumAn. Then they reach thirupputkuzhi and perform mangaLASAsanam to jatAyu mahArAjar, maragaathavalli thAyAr and vijayarAgavan emperumAn. Then they visit various dhivya dhESams around kAnchi and arrive in front of thirukkachchi nambi. In the mean time, gOvindhap perumAL became very pale due to his suffering in separation of his AchArya periya thirumalai nambi. Understanding his grief, udaiyavar tells him to go and have dharSan of his AchArya and sends him along with a couple of SrIvaishNavas. He remains in kAnchIpuram and worships dhEvAdhirAjan emperumAn along with thirukkachchi nambi. gOvindhap perumAL reaches thirumalai nambi’s residence and waits at the entrance as the doors were shut. When on-lookers informed thirumalai nambi about gOvindhap perumAL’s arrival, he refuses to open the door and tells him to return to udaiyavar and consider him as the only refuge. gOvindhap perumAL fully understanding his AchArya’s divine will, returns to udaiyavar. The SrIvaishNavas who accompanied gOvindhap perumAL narrated the incidents to udaiyavar and he became very pleased on hearing the insturctions of thirumalai nambi. Subsequently, they leave kAnchIpuram and arrive at SrIrangam. They were welcomed ceremoniously by the local SrIvaishNavas and udaiyavar goes to periya perumAL in proper sequence (of sannidhis). periya perumAL welcomes him with great love, enquires about his journey, offers his honours such as thIrtham, SrI SatakOpam etc. Then, udaiyavar mercifully conducts his routines teaching everyone in SrIrangam about the great philosophy etc. gOvindhap perumAL too joyfully participates in the kAlakshEpams (lectures) and kainkaryams. When once a few SrIvaishNavas were praising gOvindhap perumAL, he acknowledged the same and felt happy. Seeing that, udaiyavar tells him “When some one praises you, you cannot simply accept it. Instead you should say that you are not qualified to receive any praises”. Hearing this, gOvindhap perumAL replied “I was in kALahasthi in a lowly state. If any one praises me, that is because of your great compassion which reformed me and brought me to this state - so all the praises really belong to you only”. emperumAnAr heard this and approved gOvindhap perumAL’s great nishtai. He then embraces gOvindhap perumAL saying “You pass of your good qualities to me also”. gOvindhap perumAL was very detached from all aspects of worldly pleasure and emperumAnAr finally orders him to take up sanyAsASramam. gOvindhap perumAL accepts sanyAsASramam and was named by emperumAnAr as embAr. Subsequently, aruLALap perumaL emperumAnAr composes gyAna sAram and pramEya sAram which brings out the essence of our sampradhAyam. Wanting to establish vEdhAntha principles clearly, emperumAnAr along with kUraththAzhwAn and other Sishyas goes to kAshmir to get bhOdhAyana vruththi grantham (a commentary for brahma sUthram). He collects the same and starts heading towards SrIrangam. On the way, some miscreants from kAshmir snatches the grantham and run away. emperumAnAr becomes grief-stricken since he had not read the grantham fully but kUraththAzhwAn consoled him and said that he had fully read the same while emperumAnAr was resting. After returning to SrIrangam, emperumAnAr orders AzhwAn to document the commentary for brahma sUthram as dictated by him. He tells AzhwAn that if ever there is disagreement in the principles explained, AzhwAn can stop writing. Once, while explaining the true nature of AthmA, emperumAnAr explains it to be gyAthruthvam (abode of knowledge) without emphasis on SEshathvam (servitude). AzhwAn stops writing since gyAnam about SEshathvam is most important nature of AthmA. emperumAnAr becomes angry and insists AzhwAn to write what he says. AzhwAn still refuses and emperumAnAr manifests his anger greatly. When others ask AzhwAn what he thought about emperumAnAr’s actions, AzhwAn simply said “He is the owner and I am the owned. He can do whatever he wants to me”. After a while, emperumAnAr analyzes the situation, realizes his mistake, asks AzhwAn for forgiveness and continues dictating with the proper meaning. In this manner, SrI bhAshyam, vEdhAntha dhIpam, vEdhAntha sAram, vEdhArtha sangraham, gIthA bhAshyam were blessed by emperumAnAr and thus eliminated the grief of ALavandhAr who wanted these principles to be clearly explained. The SrIvaishNavas approached udaiyavar and told him “Your highness have established our philosophy and defeated other philosophies. Now, please go on a pilgrimage and worship the various dhivya dhESams too”. Agreeing with them, udaiyavar goes along with them to namperumAL and prays for his permission to commence his pilgrimage. namperumAL gives permission to do so. Along with many SrIvaishNavas, udaiyavar commences his pilgrimage and visits many dhivya dhESams and kshEthrams across the bhAratha dhESam. He starts with chOLa nAdu and visits thirukkudanthai and many dhivya dhESams in that region. He then visits thirumAlirunchOlai and other temples, goes to thiruppullANi and visits sEthu samudhram, and arrives in AzhwArthirunagari. He performs mangaLASAsanam to nammAzhwAr polindhu ninRa pirAn. nammAzhwAr becomes very pleased on seeing emperumAnAr and gives him all honors. udaiyavar then visits all other temples in nava thiruppathi. All along he defeats many opposing philosophers and establishes viSishtAdhvaitha philosophy. He then arrives at thirukkuRungudi. nambi welcomes udaiyavar and speaks to him through archakar. He asks “While I was not able to gather many disciples even after descending in various incarnations, how are you able to reform many?”. udaiyavar says “I can explain it to you only if you ask as a disciple”. At once, nambi, offers a simhAsanam to udaiyavar and stands next to him submissively. udaiyavar sits next to the throne, meditating upon his AchArya periya nambi on the throne and explains the greatness of dhvaya mahA manthram to nambi and tells him that it is through the power of dhvaya mahA manthram he convinces everyone to accept this sacred path. nambi becomes very pleased and accepts SrI rAmAnuja as his AchArya and emperumAnAr happily names him “SrIvaishNava nambi|”. Subsequently, udaiyavar goes to thiruvaNparisAram, thiruvAttARu and thiruvananthapuram. He establishes a mutt in thiruvananthapuram and wins over many philosophers in that region. He then worships the emperumAns in other dhivya dhESams in the region and goes along the west coast and reaches northern part of bhAratha dhESam. He performs mangaLASAsanam at mathurA, SALagrAmam, dhvArakA, ayOdhyA, bhadhrikASram, naimiSAraNyam, pushkaram and also visits gOkulam, gOvardhanam, vrindhAvanam etc., and defeats many scholars of various other philosophies. He then arrives at kashmIr and goes to sarasvathI bhaNdAram (literary center) which is presided over by sarasvathI dhEvi herself. She herself welcomes udaiyavar and asks him to explain the meaning of “thasya yathA kapyAsam” SlOkam from chAndhOgya upanishath [It is this SlOkam which caused rift between Sri rAmAnuja in his childhood with his teacher yAdhava prakASa]. udaiyavar gives detailed explanation for that and establishes the proper meaning of the same. sarasvathi becomes very pleased with that explanation and holds his SrI bhAshyam (commentary for brahma sUthram) on her head and praises him. She then glorifies him with the title “SrI bhAshyakArar” and presents him a deity of SrI hayagrIva. When udaiyavar asked why she was so delighted, she says, previously Sankara visited her and when she enquired the meaning for the same SlOkam, he was unable to explain it precisely and gave an incoherent explanation. She said “since you explained the correct meaning which pleases me, I am so delighted”. The scholars who witnessed this became agitated and came to debate with him. He defeated all of them in debate and established the philosophy. Seeing this, the king becomes amazed and becomes a disciple of udaiyavar. The defeated scholars become angry and they try to kill udaiyavar through black magic. But it backfires and they start fighting each other. The king comes and requests udaiyavar to save them all and finally they become pacified and they all become disciples of udaiyavar. He then travels to vAraNAsi, takes a holy dip in gangA and worships kaNdamennum kadi nagaram dhivya dhESam.. He then arrives at purushuOththama dhAmam (jagannAtha puri) and performs mangaLASAsanam to jagannAthan emperumAn. He defeats the mAyAvAdha philosophers and establishes a mutt in there. He then visits SrI kUrmam, simhAdhri and ahObilam. He finally arrives at thiruvEnkatam. At that time, some Saivas were causing a dispute saying the main deity thiruvEnkatamudaiyAn is rudhra. udaiyavar then says “You can place the weapons/symbols that are unique to your lord and we will place Sanka and chakra in front of him. Let the lord himself decide who he is by picking up the right weapons”. They sent everyone out of the sanctum, locked it down completely and left for the night. When they came back and reopened the door in the morning, to the great pleasure of udaiyavar and other SrIvaishNavas, emperumAn adorned the Sanka and chakra. After that udaiyavar descended to thiruppathi and started his journey from there. He then visits kAnchIpuram, thiruvallikkENi, thirunIrmalai and dhivya dhESams in that region. He then arrives at madhurAnthagam and then defeats many mAyAvadha scholars in the thoNdai maNdalam. He then visits thiruvahindhrapuram and kAttumannArkOyil. In this manner, he visits many dhivya dhESams, completes his pilgrimage and returns to SrIrangam. He then worships periya perumAL reciting amalanAdhipirAn. periya perumAL enquires his well-being and udaiyavar says “we who are constantly meditating upon you, have no worries”. He continues to reside in SrIrangam and conducts his daily routines mercifully there. During this time in SrIrangam, kUraththAzhwAn could not go out for his alms one day due to rain. He completed his evening anushtAnams and did not accept any prasAdham. In the night, namperumAL’s temple bell rang indicating bhOga offerings to him. His wife ANdAL, feeling upset about his husband’s state told namperumAL “When your devotee is fasting here, you seem to feasting”. Understanding her feelings, namperumAL at once sends his servitors to AzhwAn’s residence with his prasAdham. AzhwAn being very surprised on their arrival looked at his wife and she revealed what happened. AzhwAn was not too pleased about imposing upon emperumAn for his situation. Yet he accepted 2 handfuls of prasAdham, took some and gave the remnants to his wife. These two handfuls of prasAdham eventually lead ANdAL to give birth to two beautiful children. After 11 days of Asoucham, on the 12th day, emperumAnAr along with embAr and other SrIvaishNavas eagerly arrived at AzhwAn’s residence to bless the children. emperumAnAr asks embAr to bring the children to him. embAr, took bhattar in his hand and brought him over. emperumAnAr lovingly takes the child in his hand and blesses him. He says to embAr “I see some divine glow in this child and smell a divine fragrance. What did you do?”. embAr replies “I recited dhvaya mahA manthram as protection for the child”. emperumAnAr says to embAr “Oh, you are well ahead of me. Let you be the AchArya for this child”. He then names the child “parASara bhattar” in memory of sage parASara and fulfils his second obligation to ALavandhAr. He oversees embAr performing samASrayaNam to the child. He also orders AzhwAn to give parASara bhattar in adoption to periya perumAL (SrI ranganAthan) and periya pirAttiyAr (SrI ranganAyaki) themselves. AzhwAn obliges. In his infancy, parASara bhattar was taken care of periya pirAttiyAr herself and also when bhOgam is kept in front of periya perumAL, he would put his hand straight in to the pot and eat of it before perumAL does so, and periya perumAL would joyfully consume the bhOgam after that. bhattar grew to be most intelligent at a very young age and became the leader of our sampradhAyam after emperumAnAr and embAr’s days. embAr’s pUrvASrama brother, siRiya gOvindhap perumAL’s wife begets a child and emperumAnAr names him “SrI parAnkuSa nambi” in memory of nammAzhwAr, fulfilling his third obligation to ALavandhAr. mudhaliyANdAn had great attachment towards emperumAnAr and emperumAnAr too showed great affection towards him. When he was ordered to go as the maid-servant for periya nambi’s daughter aththuzhAy, without hesitation, he followed the orders of emperumAnAr. When emperumAnAr’s AchArya, periya nambi performed ALavandhAr’s great Sishya, mARanEr nambi’s final rites, the local SrivaishNavas did not approve that action since periya nambi was a brAhmaNa and maRanEr nambi was from an outcaste family. They go and complain to emperumAnAr. emperumAnAr summons periya nambi and asks for an explanation. periya nambi explains the greatness of mARanEr nambi and insists that his action was justified. emperumAnAr becomes pleased and tells everyone that, he was always in agreement with periya nambi, but only requested explanation from him to convince everyone else. At this time, when everyone was living joyfully in SrIrangam under the guidance of emperumAnAr, the evil king who had affiliations with Saiva philosophy desired to establish the supremacy of Siva. He called out for all scholars and forced them to sign off of Siva’s supremacy. nAlurAn, a Sishya of AzhwAn, told the king “What is the use of many ignorant people accepting it? Only if you can get SrI rAmAnuja and AzhwAn to agree upon it, it will become truth”. Hearing this, the kings sends his soldiers to SrI rAmAnuja’s mutt, to bring him to the court. At that time SrI rAmanuja had gone for his bathing and AzhwAn who was at the mutt, understood the intentions of the king, dressed like SrI rAmAnuja in saffron robes, carries his thridhaNdam and goes to the court along with the soldiers. On his return to the mutt, SrI rAmAnuja found out about this, and was warned to leave the place due to imminent danger. He wore the white robes of AzhwAn and escaped from SrIrangam along with his disciples. When some soldiers found out about his escape, they started chasing him. But SrI rAmAnuja picked up some sand, sanctified them and gave that to his disciples who sprinkled that on the way. The soldiers felt acute pain on stepping over that sand and withdrew from their chase. emperumAnAr then statrs travelling towards mElkOte (thirunArAyaNapuram) which is considered to be a safer location. On the forest way, they meet some hunters who were instructed and initiated by nallAn chakravarthi (who is a disciple of emperumAnAr). They welcomed everyone who have been travelling by foot for 6 days by then and were very hungry. They enquired about the well-being of emperumAnAr and when the SrIvaishNavas told them, emperumAnAr is here and showed him, the hunters were blissful. They offered some honey and millets which were accepted by everyone but emperumAnAr. They also lead them to nearby village where a brAhmaNa family lived, and provided raw-materials for their food. The wife of the brAhmaNa (kongilAchchAn) there offered praNAmams to everyone and requested them to accept cooked food. The SrIvaishNavas refused to accept food saying they cannot accept from everyone. She at once said, she is also a disciple of emperumAnAr and explained that she got initiated by emperumAnAr when she was in SrIrangam some time ago. She said - Those days when I was in SrIrangam, the kings and ministers used to come and take the blessings of emperumAnAr. But he would everyday go to collect alms. I asked him “Why is this contradiction?” and he said “I give them knowledge about bhagavAn”. I asked him to give the same instructions to me and he then initiated me into the sampradhAyam. When we had to return to our home town, I asked for his blessings and he gave his divine sandals to me. Then we returned here. Hearing all of these, emperumAnAr (without revealing his identity), told the SrIvaishNavas to accept food prepared by her. But he told one SrIvaishNava to watch her efforts. She finished her cooking, went into the pUjA room and meditated in front of the kOyilAzhwAr (deity room). The SrIvaishNava observed a deity like object which looked different from normal deities. He informed the same to emperumAnAr. emperumAnAr then asked her “What did you do inside?”. She replies “I offered my prayers to the divine sandals given by emperumAnAr to me and offered the food to them”. He asks her to bring them out and she does so. He realizes that they are his own. He then asks her “Do you know if emperumAnAr is here?” and she lights a lamp and checks everyone’s feet. When she looks at emperumAnAr’s divine feet, she becomes amazed with joy and tells “this looks like emperumAnAr’s divine feet, but since you are wearing white robes, I am not able to identify”. emperumAnAr then reveals his identity and asks her to repeat his instructions. She happily tells them and he then allows everyone to consume the prasAdham. He himself does not consume, saying that the food was not offered to bhagavAn. She then offers some fruits, milk and sugar blocks and he offers them to his perumAL first and then consumes them. She then takes the food remnants of all the devotees and presents them to her husband but she herself does not consume the same. When her husband asked why, she says “you have not accepted emperumAnAr as your AchArya. He has come all the way to our home. Only, if you promise to accept him, I will consume prasAdham”. He agrees and then she consumes prasAdham. In the morning, he goes to emperumAnAr and surrenders unto him. emperumAnAr instructs him and accepts him as Sishya. emperumAnAr then gets saffron robes and thridhaNdam, stays there for a few days and then starts travelling further west. He reaches sALagrAmam, which is filled with baudhdhas and jainas who ignore him. He orders mudhaliyANdAn to wash his divine feet in the common pond and everyone who consumed water from that sanctified pond became attracted towards emperumAnAr. vaduga nambi, accepts emperumAnAr as everything for him and becomes to be a great example of AchArya bhakthi. He then reaches thoNdanUr where he cures the daughter of vitala dhEva rAya (the king of the region) who was possessed by a ghost. The king and the family become disciples of emperumAnAr and emperumAnAr names the king vishNu vardhana rAya. Hearing this, 12000 jaina philosophers come to debate with emperumAnAr, and emperumAnAr debates with all of them at once having a screen in between them and him. Behind the screen, he assumes his original thousand hooded AdhiSEsha form and answers all of their questions at once. Many of the defeated scholars become his disciples and he shows them his greatness. The king too glorifies emperumAnAr. In this manner, while emperumAnAr was living in thoNdanUr, he exhausted his thirumaN and hence he becomes grieved. While he was sleeping, thirunArAyaNApuram emperumAn appears in his dream and tells him “I am waiting for you in thiruNArAyaNapuram. Here, we have thirumaN too”. With the help of the king, emperumAnAr reaches thiruNArAyaNapuram and goes to worship emperumAn. But to his sorrow, he observes that there is no temple there. Out of fatigue, he rests for a few moments and emperumAn again appears in his dream and shows him the exact location where he is buried under ground. emperumAnAr then brings emperumAn out of the ground, submits him “oru nAyagamAy” decad from thiruvAimozhi in which nammAzhwAr greatly glorifies thirunAraNan emperumAn. He then finds thirumaN and applies that in twelve places on his body. Subsequently, he clears the town, re-constructs the temple and arranges many servitors for emperumAn there. Due to lack of uthsava vigraham (processional deity), there was no possibility of conducting uthsavams. When emperumAnAr was worried about that, emperumAn again appears in the dream of emperumAnAr and tells him “rAmapriyan (uthsavar) is present in Delhi Badshah’s palace”. emperumAnAr at once leaves to Delhi and requests the king to return the vigraham. The king brings him to the private quarters of his daughter and shows him the vigraham. The daughter of the king was fondly attached to the vigraham and was lovingly caring for the emperumAn. Being very pleased seeing emperumAn, emperumAnAr calls him out “chellappiLLai come here”. emperumAn at once jumps out and sits on the lap of emperumAnAr. The king became amazed at that and submits many ornaments etc to emperumAn and sends him along with emperumAnAr. The daughter of the king becomes greatly grieved due to the separation from emperumAnAr and starts following emperumAnAr’s entourage. At the border of thirunArAyaNapuram, emperumAn accepts her in him like he accepted ANdAL. emperumAn names her thulukka nAchchiyAr and performs her prathishtA (installation) at emperumAn’s divine feet. He then re-consecrates uthsava vigraham inside the temple and conducts all the uthsavams there. In this manner, he stayed in thiruNArAyaNapuram for twelve years engaging in many kainkaryams and nurturing many SrIvaishNavas to cultivate our sampradhAyam. He hears from SrIrangam through mAruthi siRiyANdAn that the Saiva king died and becomes joyful. He decides to start to SrIrangam. His disciples became drowned in an ocean of sorrow hearing about his departure to SrIrangam. emperumAnAr consoled them and to fulfil their desire, agrees to the consecration of his own vigraham (deity) there. It is this deity which is famously known as “thamar ugandha thirumEni”. Subsequently, he leaves thiruNArAyaNapuram and arrives at SrIrangam. He performs mangaLASAsanam to periya pirAttiyAr and periya perumAL and continues to nurture our sampradhAyam from SrIrangam. In SrIrangam, after performing mangaLASAsanam to periya perumAL and rejuvenating himself by going around the temple, udaiyavar along with the SrIvaishNavas visited kUraththAzhwAn’s residence. AzhwAn with great devotion, falls at the divine feet of udaiyavar, holds on to the divine feet and stays put there. udaiyavar picks him and embraces him with overwhelming emotions, remains dumbfounded with great sorrow looking at AzhwAn who lost his eyes. With tears in his eyes and a broken voice, He says to AzhwAn “For our dharSanam (sampradhAyam), you have lost your dharSanam (eyes)” and AzhwAn humbly says “It is a result of my apachArams (mistake/fault) only” and udaiyavar consoles him saying “How could you have committed any apachAram? It should be my apachAram which should have caused this”. Eventually everyone steadies themselves and udaiyavar returns to his mutt. At this time, some SrivaishNavas come to udaiyavar and inform him that thiruchchithrakUtam (now famously known as chidhambaram) temple was destroyed by miscreants [of Saiva faith]. He came to know that the uthsava vigraham of the emperumAn was safely carried to thiruppathi. He at once left to thiruppathi, ordered the construction of SrI gOvindharAjap perumAL, consecrating a new mUla mUrthi who resembles gOvindharAja bhagavAn of thiruchchithrakUtam [This is the gOvindharjAr sannidhi we see in the foot hills of thiruppathi these days]. He performs mangaLASAsanam to thiruvEnkatamudaiyAn on thirumalai, starts his journey towards SrIrangam, stops on the way at kAnchIpuram, performs mangaLASAsanam to dhEvap perumAL and returns to SrIrangam. He continues leading the sampradhAyam from there. Subsequently, udaiyavar invites AzhwAn and tells him to praise dhEvap perumAL who would fulfil all prayers and orders him to request dhEvap perumAL that his vision is reinstated. AzhwAn hesitates but udaiyavar forces him to do so. He then compiles varadharAja sthavam and in the end prays that he sees emperumAn with his internal eyes. emperumAn happily bestows him that boon and AzhwAn explains that to udaiyavar. udaiyavar, not being satisfied with that, brings along AzhwAn to kAnchIpuram and asks AzhwAn to recite the varadharAja sthavam fully in front of dhEvap perumAL. udaiyavar goes to attend another matter and AzhwAn completes the recital at that time. dhEvap perumAL asks AzhwAn to reveal his desire and AzhwAn says “nAlUrAn should attain the same goal as I do” and dhEvap perumAL obliges. udaiyavar returns and hears about this and becomes upset with both perumAL and AzhwAn and chastises both for not following his desire. dhEvap perumAL then blesses AzhwAn with the vision that will make him see dhEvap perumAL and udaiyavar. AzhwAn, being blessed, visualizes dhEvap perumAL’s divine decoration, ornaments etc to udaiyavar and udaiyavar feels satisfied. When udaiyavar was lecturing nAchchiyAr thirumozhi meanings, he starts explaining the meaning of “nARu naRum pozhil” pAsuram which relates to ANdAL’s desire to present 100 vessels of sweet rice and 100 vessels of butter to thirumAlirunjOlai emperumAn. udaiyavar at once commences his journey to thirumAlirunjOlai dhivya dhESam and offers the same on ANdAL’s behalf. He then visits SrIvillipuththUr and performs mangaLASAsanam to ANdAL and rangamannAr emperumAn. ANdAL being very pleased with udaiyavar’s act of fulfilling his desire as a brother would do, calls udaiyavar as “nam kOyil aNNar” (my elder brother from SrIrangam). He then goes to AzhwArthirunagari and performs mangaLASAsanam to AzhwAr and AdhinAthar and returns to SrIrangam to continue his activities in leading the sampradhAyam. · kUraththAzhwAn, mudhaliyANdAn, nadAdhUr AzhwAn, bhattar et al would help him in propagating SrIbhAshyam. · aruLALap perumAL emperumAnAr performs thiruvArAdhanam for emperumAnAr’s personal deities. · kidAmbip perumAL and kidAmbi AchchAn managed the thirumadaippaLLi (kitchen). · vaduga nambi prepared oil for udaiyavar’s use. · gOmadaththAzhwAn would carry pots and sandals of udaiyavar. · piLLai uRangA villi dhAsar managed karuvUlam (ornaments, etc). · ammangi prepares milk and ukkalAzhwAn distributes prasAdham. · ukkalammAL performs thiruvAlavatta (fan) kainkaryam. · mAruthip periyANdAn holds the small pot for udaiyavar’s use. · mAruthich chiRiyANdAn manages the groceries for the mutt. · thUya muni vEzham brings holy water. · thiruvarangamALigaiyAr manages SrI baNdAram (provisions stores). · vaNdar and seNdar (nephews of piLLai uRangA villi dhAsar) would earn huge salary from the king by serving him and give that wealth to the mutt. · irAmAnusavELaikkArar performs the duty of a bodyguard for udaiyavar. · agaLanga nAttAzhwAn would debate with other philosophers. udaiyavar’s greatness was revealed by periya perumAL, thiruvEnkatamudaiyAn, pEraruLALan, thirunArAyaNap perumAL, azhagar, thirukkuRungudi nambi, nammAzhwAr, SrIman nAthamunigaL, ALavandhAr, periya nambi, thirukkOshtiyUr nambi, thirumalai nambi, thirumAlai ANdAn, AzhwAr thriuvarangap perumAL araiyar, many of his own disciples, brahma rAkshas and the mute person. Let us see them briefly. · periya perumAL (SrIrangam) bestowed both spiritual and material realms to udaiyavar and allowed him to freely distribute the same to his followers. · thiruvEnatamudaiyAn (thirumalA thiruppathi) reconfirmed the title conferred by periya perumaL to emperumAnAr and established him as “udaiyavar”. He also gave mOksham to thumbaiyUrk koNdi, a lady who sells curd, on the mandate of udaiyavar. · pEraruLALan (kAnchIpuram) helped udaiyavar defeat yagya mUrththi in debate and ordered yAdhava prakASa (previously from different sidhdhAntham, and a teacher of udaiyavar) to become the Sishya of udaiyavar and accept sanyAsASram (ascetic order) from udaiyavar. · thirunArAyaNan (mElkOte) allowed udaiyavar to re-establish the divine kshEthram and became the dear son of udaiyavar allowing him to pick up and embrace selvap piLLai (uthsavar). · azhagar (thirumAlirunchOlai) revealed udaiyavar’s greatness in two incidents - by ordering periya nambi descendants to join the udaiyavar’s disciples group when they thought they were coming in the AchArya paramparai of udaiyavar and by highlighting to kidAmbi AchchAn that one who is surrendered to udaiyavar is never an orphan. 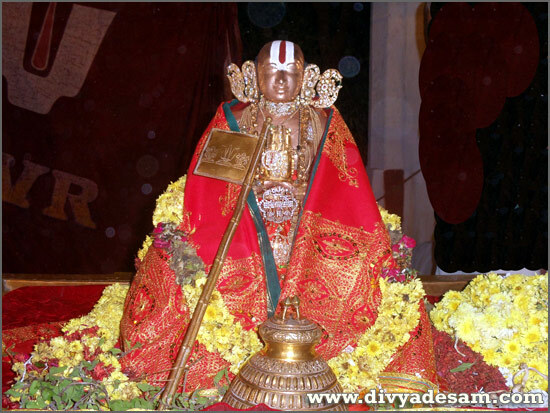 · thirukkuRungudi nambi accepted udaiyavar as his AchArya and became to be famously known as SrIvaishNava nambi. · nammAzhwAr became anguished thinking about the suffering souls in this world but then foresaw the appearance of emperumAnAr and became happy singing “poliga! Poliga! poliga!”. · SrIman nAthamunigaL said “If we teach, only a few souls will be helped, but if SrI rAmAnujar teaches, it will benefit everyone, like the reservoir of vIra nArAyaNapuram lake benefits everyone in the town”. · ALavandhAr declared udaiyavar as “Am mudhalvan” (he is the apt leader for our sampradhAyam). · periiya nambi offered obeisances to SrI rAmAnujar considering his greatness, even though they shared an AchArya Sishya relationship. · thirukkOshtiyUr nambi conferred the title “emperumAnAr” (greater than emperumAn) to udaiyavar, knowing his magnanimity in sharing the secret teachings to those who desire to learn the same. · thirumAlai ANdAn had some disagreements with udaiyavar. Once he realized the greatness of udaiyavar, he praised him greatly and ordered his son to become udaiyavar’s disciple. · thiruvarangap perumAL araiyar explained the most confidential teachings of “AchArya abhimAnam” to udaiyavar and ordered his son to become udaiyavar’s disciple. · udaiyiavar’s disciples declared total faith at his divine lotus feet and considered them to be the means and goal. · amudhanAr compiled rAmAnusa nURRanthAdhi which became part of 4000 dhivya prabandham eventually. · brahma rakshas (the demon which entered into the body of the daughter of the local king) ignored yAdhavaprakASa and highlighted that SrI rAmAnuja is the leader of nithyasUris. · A mute person who became blessed by udaiyavar disappeared for a few years, reappeared and said “udaiyavar is none other than vishvaksEna himself”. He then disappears again. · In this manner, many great personalities revealed udaiyavar’s greatness. · Though there are many incarnations, SrI rAma and krishNa are considered to be special - due to their specific activities of providing refuge, instructing gIthA etc. · Though there are many dhivya dhESams, kOyil (SrIrangam), thirumalai (thiruppathi), perumAL kOyil (kAnchIpuram) and thirunArAyaNapuram are considered to be special due to the special relationships with AchAryas there etc. · Though there are many sages, vEdha vyAsa bhagavAn, parASara bhagavAn, Saunaka bhagavAn, Sukha bhagavAn, nAradha bhagavAn et al are special due to their contribution in vEdham, vEdhAntham, purANa and ithihAsam revelations. · Though there are many AzhwArs, nammAzhwAr is special due to revealing the essential truths, philosphies etc clearly. · Similarly, udaiyavar is special that he has contributed in all these aspects and provided a strong platform to our sidhdhAntham and sampradhAyam and paved the way for the great growth of our sampradhAyam. All of udaiyavar’s Sishyas were fully faithful at his divine feet due to their AchArya nishtai and due to emperumAnAr being the divine feet of nammAzhwAr and since nammAzhwAr himself foretold the appearance of emperumAnAr in his thiruvAimozhi “poliga poliga poliga” decad. Also, udaiyavar is considered as direct Sishya of nammAzhwAr as he established our sampradhAyam based on AzhwAr’s thiruvAimozhi. He is also considered as the direct Sishya of ALavandhAr since he fully understood ALavandhAr’s divine heart and fulfilled ALavandhAr’s desires, though they did not meet each other. When udaiyavar was explaining the principle of SaraNAgathi through SrI rAmAyaNam, vibhIshaNa SaraNAgathi incident, piLLai uRangA villi dhAsar became perplexed. udaiyavar observed that and asked why dhAsar looked worried. dhAsar said “if vibhIshaNa who gave up everything and surrendered to SrI rAma, was made to wait before being accepted, what is our state? Will we get mOksha?”. udaiyavar replied “Listen my son! If I get mOksha you will get mOksha;if periya nambi gets, I will get; if ALavandhAr gets, periya nambi will get and it goes on upto nammAzhwAr who already declared in thiruvAimozhi that he got liberated; so you are sure get mOksha” and consoles dhAsar. It is established by amudhanAr through the divine prabandham rAmAnusa nURRanthAdhi that emperumAnAr is the only means for us to get mOksham and serving him and his devotees are the goals for us. mudhaliyANdAn requests such emperumAnAr to allow them to prepare a deity of emperumAnAr and consecrate the same in SrIperumbUthUr, his birth place, so that every one can worship him even in the future. On receiving emperumAnAr’s orders, a beautiful deity is prepared by a devoted sculptor. The deity was made in SrIrangam to the full satisfaction of emperumAnAr that he embraced the same and sent it to SrIperumbUthUr to have it consecrated on guru pushyam (thai pUsam) day. udaiyavar continued to live a glorious life for 120 years in this manner. He felt the urge to leave the material realm and reach the spiritual realm to be along with the nithysUris. He approached periya perumAL through periya pirAttiyAr by reciting gadhya thrayam and prayed to periya perumAL that he is released from the material coil immediately. periya perumAL then agreed to liberate emperumAnAr 7 days from that day and informed the same to him. emperumAnAr then requested to perumAL “all those who are related to me directly/indirectly should get the same benefit as myself” and perumAL joyfully obliges. udaiyavar then walked out majestically accepting farewell from periya perumAL and reached his mutt. He then showers wonderful meanings to his Sishyas for the next 3 days and they all started wondering “why is your highness suddenly giving out a lot of wonderful instructions?”. Unable to hide the information anymore, emperumAnAr mercifully revealed “I am thinking to ascend to paramapadham four days from now and perumAL too agreed for the same”. Hearing that, the Sishyas became broken hearted and declared they will all give their lives as soon as udaiyavar leaves them.udaiyavar said “if you did that, you will not be considered as related to me, so you cannot do it” and consoled them. Then emperumAnAr continues to give valuable instructions to everyone and appointed many of his Sishyas in different roles. He also ordered everyone to be favourable towards parASara bhattar, the dear son of kUraththAzhwAn. He then begs for pardon from everyone for any offenses committed and again gave his final instructions. He mainly instructs everyone to appreciate each other’s qualities and work together cooperatively like brothers. He instructs everyone to focus on kainkaryams (selfless service) instead of engaging in work in return of any favour. He also highlights the importance of not hating SrIvaishNavas ever and not glorifying worldly people ever. He then brings bhattar to periya perumAL sannidhi, gets his thIrtham and other honorus and informs others that bhattar will lead the sampradhAyam after him. He orders bhattar to go to mElkOte and reform vEdhAnthi (who will be called nanjIyar in the future). embAr being the senior most AchArya guides his Sishya bhattar until his presence. On the day of ascending to paramapadham, he performs his nithyAnushtAnushtAna kramam such as bathing, wears 12 puNdrams (thilak), sandhyAvandhanam etc, offer thiruvArAdhanam to his personal deity, meditating upon the guruparamparai, sitting in padhmAsanam (lotus postion), focussing his mind on paravAsudhEvan and meditating upon the divine form of ALavandhAr, reclining, opening his eyes widely, placing his head on the lap of embAr and his divine feet on the lap of vaduga nambi and ascended to paramapadham in a radiant form which resembles his AdhiSEsha form. Seeing that all his Sishyas fall on the ground like a rootless tree and starts crying their heart out. After a while they consoled themselves. periya perumAL realizing his loss (and paramapadhanAthan’s gain), became dejected and refused to accept betel leaves/nuts. He then sends all his paraphernalia through uththama nambi. In the mutt, the vimala charama thirumEni (final divine form) of emperumAnAr was bathed, applied with 12 puNdrams, and was offered all upachArams (like dhIpam, dhUpam etc). piLLAn, being the abhimAna puthra (like a dear son) performs the final sacred rites for empeurmAnAr. The SrIvaishNavas of SrIrangam arrange the ceremonies with great pomp and fervour by reciting upanishaths, reciting dhivya prabandham, .arranging band and musical instruments, araiyar sEvai, reciting sthOthrams, with lots of flowers and roasted rice thrown in the streets where he was carried around. As per the orders of periya perumAL, emperumAnAr was placed under the ground as per yathi samskAra vidhi (rules pertaining to burying ascetics) inside the vasantha maNdapam of namperumAL. Subsequently, mudhaliyANdAn consecrated a special deity of emperumAnAr on top of where his divine form was buried as per the orders of periya perumAL. Subseuquently, many SrIvaishNavas hear about the news of emperumAnAr’s ascending to paramapadham and become very anguished. Some even instantaneously gave up their life being unable to bear the separation from him. Those who arrived at SrIrangam were consoled by the presence of bhattar and rejoiced themselves. In this manner emperumAnAr lived a fulfilled life for the upliftment of everyone. Even if one can explain the glories of emperumAn, there is no way anyone can explain the glories of emperumAnAr. Leading up to the sahasrAbdhi (1000th year celebrations) of emperumAnAr, we have enjoyed his life and glories. Let that experience remain in our heart forever and let us be a faithful rAmAnuja dhAsa matching up to the expectations of our AzhwArs/AchAryas from us. Note: This was originally published as series of editorial articles in "SrI rAmAnuja dharSanam" monthly e-magazine which can be seen at http://www.varavaramuni.com/home/sriramanuja-dharsanam-magazine.